In essence, this is a Corey Patterson post, but I'm really just throwing together a bunch of memories, emotions, and feelings, to see if it gets us anywhere. Going back to the 2nd of June 1998, Corey Patterson came to the Cubs with tremendous promise and pressure, as the #3 overall pick in baseball's June draft. This was the second J.D. Drew Draft, after he eschewed the opportunity to play in Philadelphia, resigning himself to a 44-game stint with the St. Paul Saints*, where he rocked a .341/.443/.706 triple-slash line. Pat Burrell was drafted first, Mark Mulder second, and Drew fifth. The Indians made the best pick, selecting CC Sabathia at 20th. All this took place during the inception of Sammy Sosa's meteoric rise to the stratosphere of American sports, fantastic pharmaceuticals, Madison Avenue inspired Pepsi commercials, and all that follows. *speaking of Independant League baseball, I'm pretty excited for Legends Day today at the Newark Bears game. It should be a beautiful afternoon, and at the risk of setting myself up for disappointment, I think I'm sitting front row on the duguout. Sometimes it feels like Setting Myself Up for Disappointment would be good as the title of a memoir. Whatever, it should be alright. Tim Raines is their manager, for crying out loud. Plus, I should at least recognize the name of one or two legends, right? On the morning of the '98 June draft, Sammy had a career best .344/.414/.608 line, with 72 hits (15 HR's) in 53 games. In June he took off, hitting 20 HR's during the month, setting a 'roid record that still stands. The Cubs won the Wild Card in '98, then promptly lost two road playoff games to the Braves, while I sat and watched numbly in Turner Field. 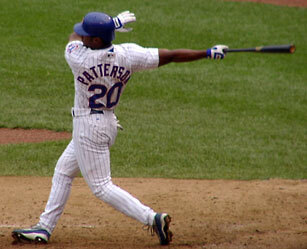 Corey Patterson was a September callup in 2000. He was not good. He also wasn't good in 2001 or 2002. He was having a much improved, almost very good 2003 before he tore a knee ligament hitting first base, ending his season with 13 HR's and 16 SB's in 83 games, as well as career highs in all three triple-slash stats: .298/.329/.511. Which looks worse, a career .291 OBP, or a career high OBP of .329? After injury, Patterson seemed to return to form. Unfortunately it became clear that his form would take a free-swinging approach to new levels of impatience. Associates of mine and I would sit in Wrigley, within earshot of Patterson and yell at him LOUDLY to NOT swing at the first pitch. More often than not, he would see a fastball at his eyes and couldn't resist. After hearing it, heck being a part of it, approximately 300 times, the sound of 30,000 fans groaning at Corey Patterson's inevitable swing and miss has a knack for staying with you. Corey Patterson strikes out too much. He's fast. He should make contact and run, or at least he should have a few years ago when he was presumably even faster. Frustration builds. It's sad. We've been here before, talking about the inhumanity of being a Cubs fan. Every generation of Cub fans, from the past 100 years, has been forced to face their mortality before celebrating a Cubs championship team. What kind of histories and legacies do Cub fans have to retell? I'm too young to tell my kids about the playing days of Banks and Santo. 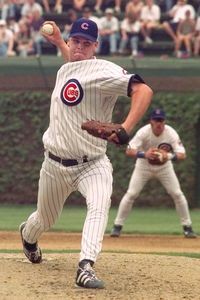 Ryne Sandberg never did it for me. While he seemed to have excellent range as a second baseman, I thought he failed to dive after too many groundballs out of his reach. Am I nitpicking a Hall of Fame career? Maybe, but I remember feeling that way as a 12-year old fan. Please allow me to insincerely apologize that I don't celebrate his career like many of my peers. Maddux. Ah, Greg Maddux. I'll certainly tell my grandkids, or anyone who'll listen for that matter, about Greg Maddux. He was a magician, a maestro, professor, and class clown. I thought he looked exactly like Matthew Broderick, which certainly added to the mystique. Finer writers than I have used their superior vocabularies to paint the the picture of this artist on the mound, but I know I have a few unique anecdotes to share. They'll have to be part of their own post. Like most stories of the Chicago Cubs since 1908, the story of Greg Maddux ends in disappointment. If you don't know, you're probably not reading this. 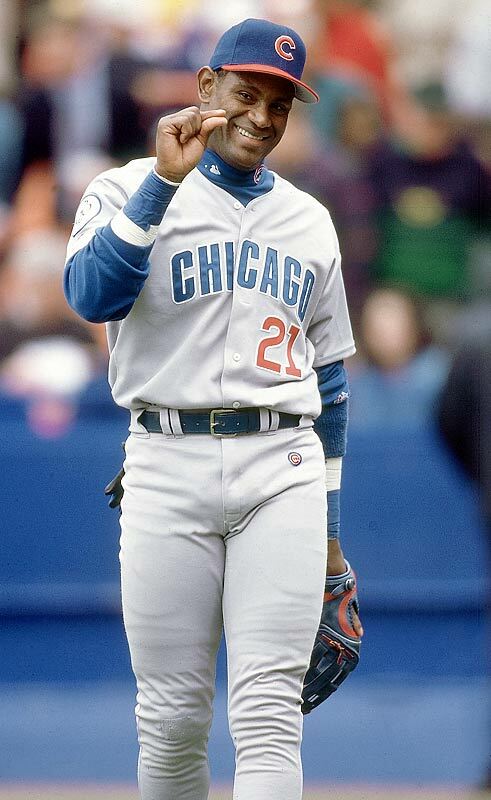 Over the past twenty-five years, or so, Cub fans have enjoyed rooting for guys like Ryno, Andre Dawson, Mark Grace, Shawon Dunston, Lee Smith, that pitching rotation of 2004, Derrek Lee, Aramis, and of course, Slammin' Sammy. Sitting here, on this hazy Sunday morning, looking back at being a Cub fan over the past quarter century, I'll have to say the most prideful and enduring moments to pass on to our next generation must include the humor and passion of Harry Caray, the artistry of Greg Maddux, and without a doubt, Kerry Wood. 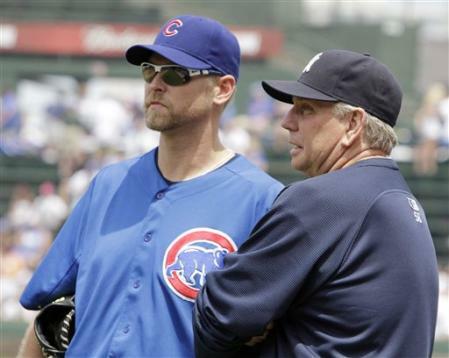 Flawed as his own story became, Kerry Wood may have been the brightest beacon of hope and pride for Cubs fans of recent history. 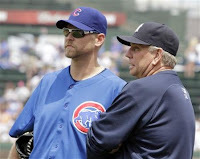 Having met Kerry Wood through a mutual friend, when we were both 19 years old, and more than two run ins with Mark Grace, I think we may have something for a pretty cool exclusive look into my views and experiences of Maddux, Grace, and Wood. For all you youngsters out there*, Corey Patterson is the warning. He's the public service announcement. Warning: being a Cubs fan may cause an entire lifetime of heartbreak and loss. But every Cubs' fan is like a settin' sun. Colvin needs a lesson in patience. Be careful, young Cubs fans. Don't give up hope, but watch where you lay your faith. There's a new Corey Patterson on the horizon, and his name is Tyler Colvin. Images like this are upsetting. This isn't the best time to be a Cubs fan, but we're still here. They will get better, and we can all just do the best we can. Go Cubs. As a fan, please allow me to request that you please, pretty please, stop letting everyone down. Please don't try to pass an inferior product for multiple seasons with excuses, apologies, or talk of improvement. We would much rather see change. If not in the front office or managerial posts, then certainly on the roster. There is still time before the non-waiver trade deadline this afternoon. Please move anyone besides Castro. Please. Trade Jeff Baker, Reed Johnson, Darwin Barney, John Grabow; anyone. Larry Rothschild shouldn't have been allowed to go to the Yankees over money.